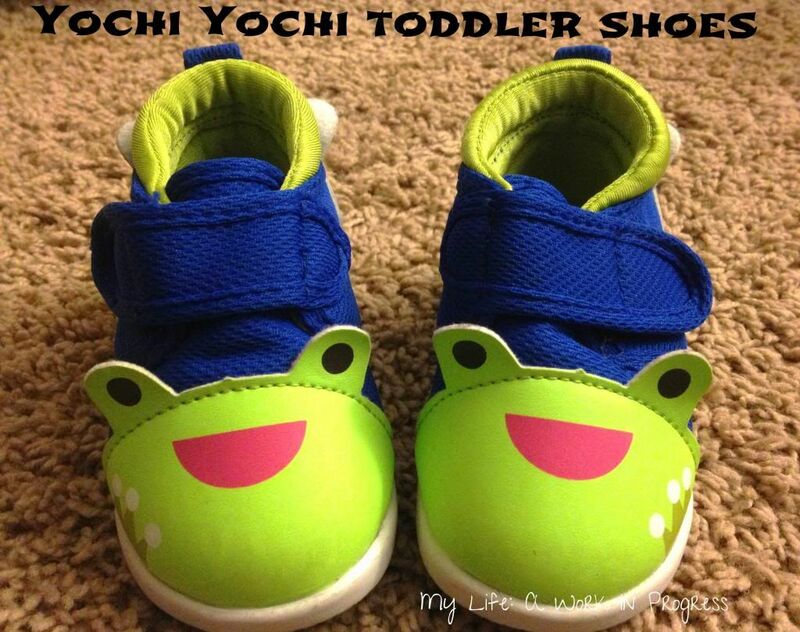 A few weeks ago Yochi Yochi sent me a pair of their Prince Kairu toddler shoes to review. 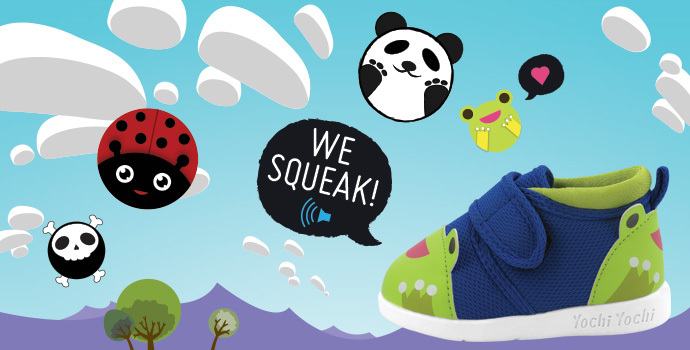 Yochi Yochi toddler shoes come in four different styles: Prince Kairu (frog), Captain Zuga (skull and crossbones), Princess Sakura (panda), and Miss Mushi (ladybug). Check them out HERE. The shoes are made with nylon and comfortable on the inside. They’re quick and easy to put on your little one’s feet thanks to the velcro closure. These shoes also feature a rubber sole and small removable diaphragm in each heel that makes a small squeak with each step. Yochi Yochi even has an updated printable size guide to ensure you order the correct size. The Yochi Yochi website has a size chart that you should print and then use to measure your child’s feet, which is what I did. This way you can determine accurately the size your child will need. We ordered a size 6, and he’s wearing about a 5 right now in his other shoes. The first time I put the Yochi Yochi shoes on Baby J, I thought his toes were all the way up against the front and that he wouldn’t be able to grow into them for long. But then I realized I just didn’t have his heel back all the way! He does, in fact, have room to grow. 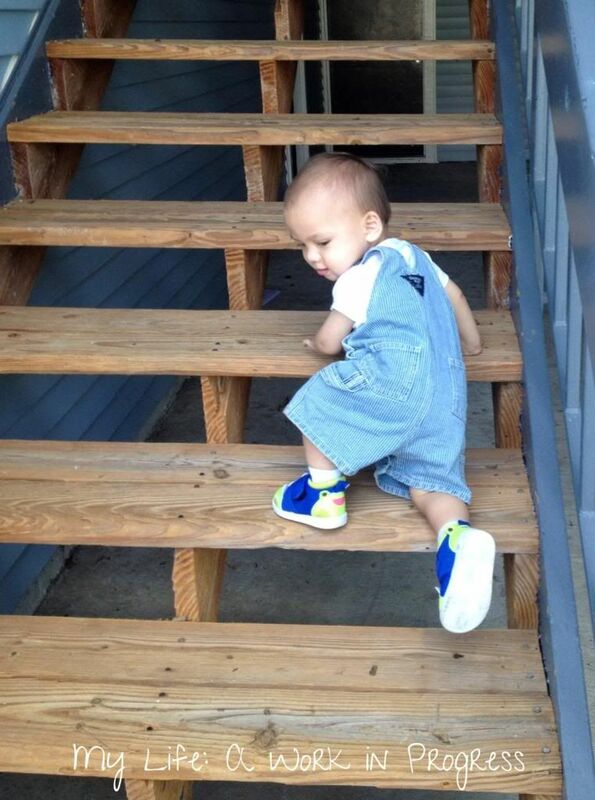 I like that I can hear where Baby J is when he walks away. Obviously I still monitor him and keep him close by wherever we go, but the shoes give me a little peace of mind. I also love that they’re easy to put on. Baby J’s feet slide in easily, and I get a firm closure with the velcro. Since Baby J thinks they’re awesome too, he’s not constantly taking them off like all the other shoes and sandals he has! A note on the washing: I would recommend spot cleaning these shoes though or hand washing rather than machine washing, because I’m sure they’ll last longer that way, but I machined washed them, and they were fine. While at the playground, Baby J walked into a big muddy puddle in the grass and the shoes ended up covered in all sorts of grossness. I ended up putting these shoes through the wash on the gentle cycle on warm and then letting them air dry. I’d resigned myself that the squeakers probably wouldn’t work anymore afterwards, but I was surprised and happy that they did. I discovered after the fact that the squeaking diaphragms are removable. Information is one area in which the brand could improve, I think. I didn’t find out the squeaker was removable until I scrolled through posts on the Yochi Yochi Facebook page. Also, it would be nice if their website would include washing instructions. The only other negative factor I can think of regarding these shoes is the price. They retail $29.95 which is a bit more than we usually pay for baby or toddler shoes (Target clearance is usually what we get!). However, after doing an online search for squeaky toddler shoes, I discovered that many squeaky shoe brands are priced from $19 to $40, with most being on the higher end of that scale. When it comes down to it, I really like these shoes. Everywhere we go, Baby J gets compliments and smiles! The shoes are really cute and fun, and he’s so adorable stomping around to hear them squeak. I took this photo after he’d been wearing the shoes for a couple of weeks, and after he’d worn them in the mud, and they’d been machine washed. Visit YochiShoes.com to browse and buy. They recently came out with a line of interactive socks for 0-12 months that rattle with each step. 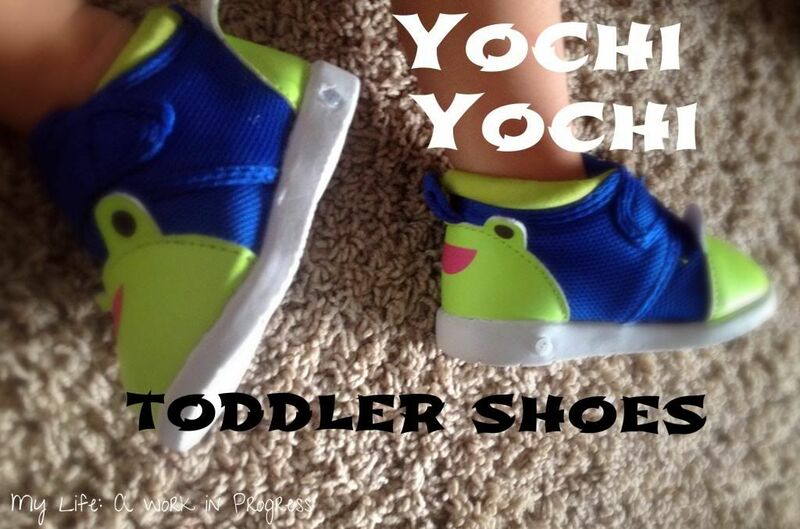 Check out the Yochi Yochi Shoes Facebook page for news, updates, and polls on their new line of shoes, coming soon! Note: I received a complimentary pair of toddler shoes from Yochi Yochi to review, but was not otherwise compensated for this post. My opinion may differ from yours or the opinions of others. Oh these are stinkin adorable! My daughter had a pair of red and white polka dotted mary janes when she was 1 or 2 that were sqeakers. We thought they were so cute, and we actually put them on her when we went to Disneyland. Half of the people thought we were geniuses (we could hear hear in a big crowd) the other half thought we were crazy… kinda like life LOL! They are so cute! And so is your little guy 🙂 Love the colors and the frogs! what a great idea! Cute shoes too! They are too cute!! I can only imagine it the squeaking as well! Those are so cute! My son loved the video too! such a cutie and he sure love his adorable shoes. Oh my goodness, those shoes are too cute! I love that they squeak! Those are just adorable! When my babies were little and starting to walk, I had such a hard time finding shoes like this for them! So cute and fun. Little man is adorable too! Awe, I just love them! Such an adorable way to help the new walking toddlers get around easier and they can be super fashionable at the same time. lol. I think they are precious. What fun designs! I love that it has a small squeak with each step! So cute! The designs and colors are adorable! I love how adorable they are! and they look comfy!! I like these the best! http://yochishoes.com/missmushi.aspx I think good for boy or girl! Your little man sure seems to love them! I love so much that they have bright colors, cute characters, and SQUEAKING! How adorable!! I love that they squeak! Thank goodness the squeakers are removable! I think it’s a cute feature, but after awhile, it’s not so cute. The Princess Sakura Shoes are my favorite design. I like that they have a size guide. My son would be so cute in these! I honestly just love freakin cute they are. I really like the lady bug ones! What a great idea to offer a printable size chart! These are adorable! I love the velcro and that they are super cute! I like squeak; easy to listen if your child is walking away from you. They also look comfortable. Squee!! These are so cute! They are all cute. I think it’s great that they squeak! Toddlers will disappear as soon as you turn your back so what a great feature lol! it’s also great that the squeaker is removable because sometimes (library, church) you want them to be as quiet as possible (as if!). THESE SHOES. They are so awesomeeee! I love that they squeak how cute is that?! They are the cutest too! I didn’t realize that they were squeaky shoes. I had a different brand of squeaky shoes for my son that I rather liked. Helped me keep track of him at times. I was sad when he grew out of them. I think my hubby was happy though.